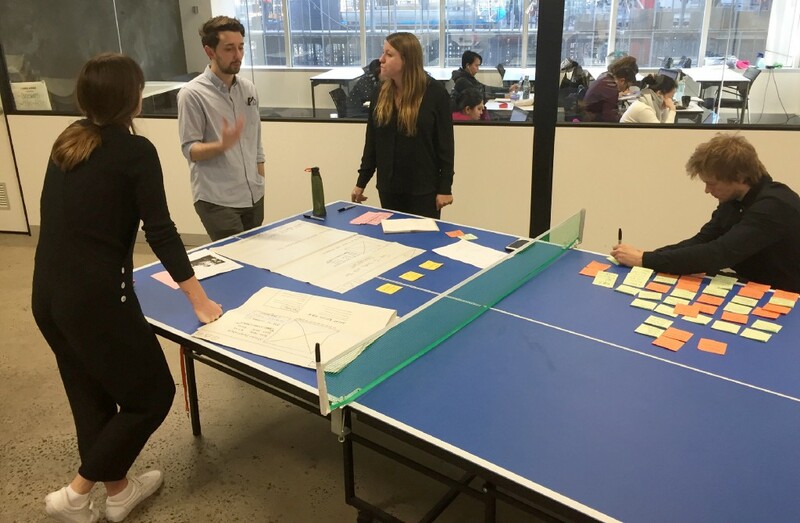 I collaborated with 3 other UX designers over the course of a 2.5 week design sprint on this project. During this time we communicated regularly with our client at each stage. We released an online survey from which we had 117 responses in conjunction with contextual inquiries including interviews with 16 people. 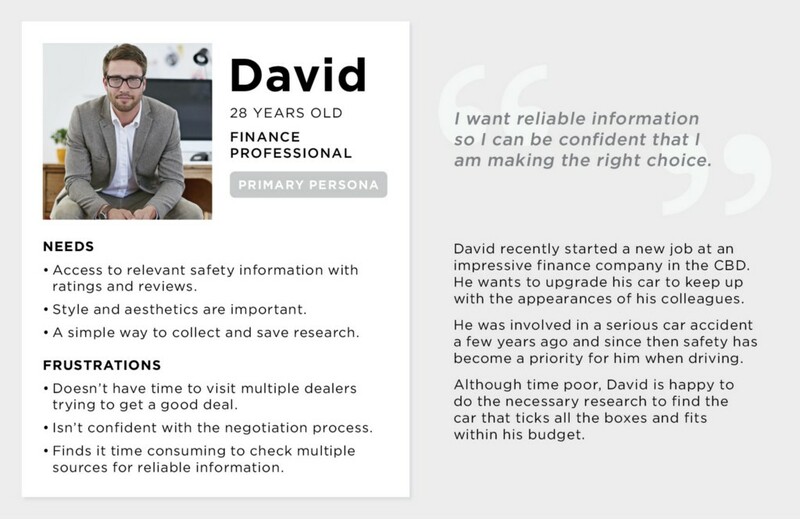 This gave us valuable quantitative and qualitative data into the reasons users purchased a new car, the factors that were of importance when making their decision and their behaviours when it came to researching a new car. 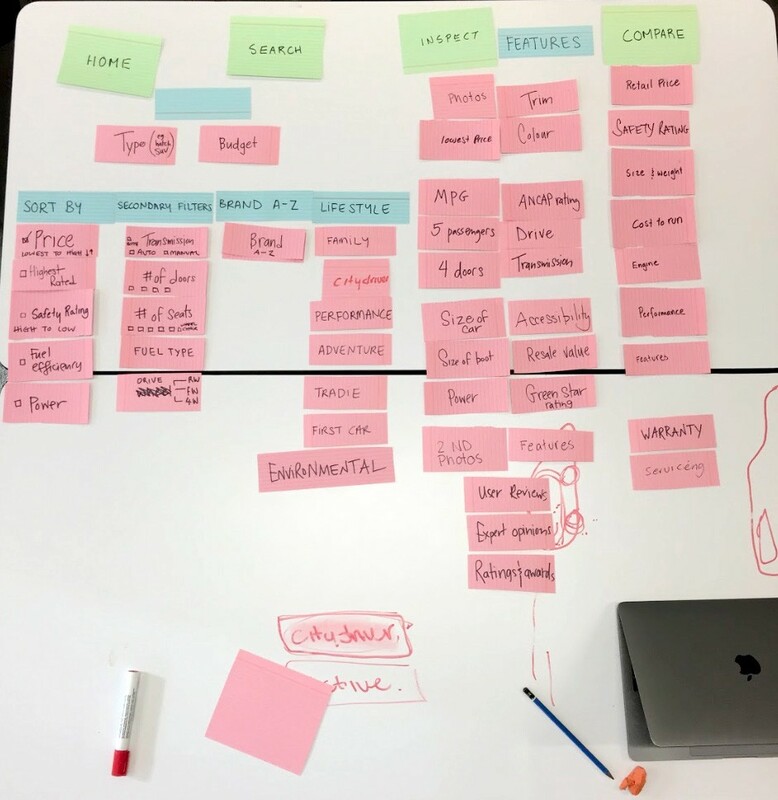 After creating an affinity map we were able to synthesise this data and found common themes emerging where we gained insights and saw opportunity areas. Users spend a considerable amount of time researching before purchasing a new car (88% of survey respondents spending up to 3 months). Users seek out trust worthy information from multiple sources. Reviews from experts, other users, and friends/family/colleges were highly valued when making a final decision. A lifestyle change and general upgrade were the key reasons for purchasing a new car. Budget and type of car were important factors when choosing a new car. Many drop off points in the current flow. Uncertainty as to the source of data presented. Copy is confusing (eg. “Get Free Sold Price Report”). Users forced to wait 24 hours to receive a Price Report via email. Currently Carloop enters the user journey briefly at the point where the user knows the specific car they want and needs an honest representation of the price. 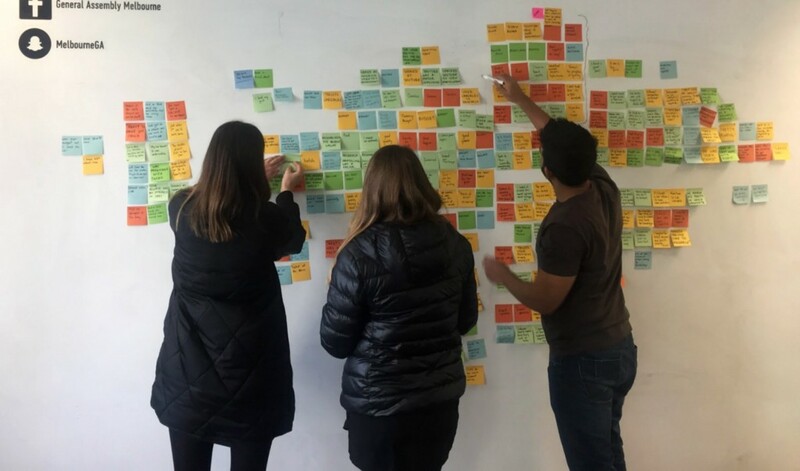 We saw an opportunity for Carloop to enter the user journey earlier in the research phase, by helping people gather information, and exit the user journey later, by helping people find the right dealership. 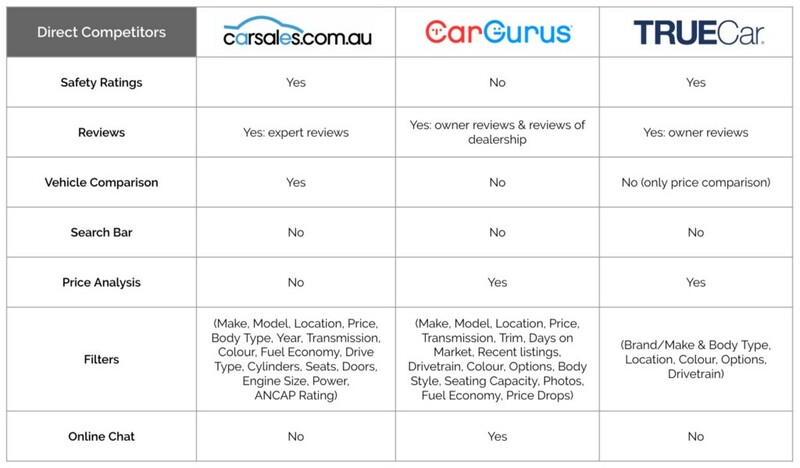 We undertook an analysis of direct competitors Carsales, CarGurus and TrueCar in conjunction with indirect competitors Choice, iSelect and TripAdvisor to get an understanding of the overall experience these websites provide to the user. Carsales: is the largest online automotive, motorcycle and marine classifieds business in Australia. CarGurus: CarGurus was the number one most visited online automotive marketplace in the U.S in 2017 and also operates sites in Canada, the UK, and Germany. TrueCar: TrueCar is a digital automotive marketplace in the U.S. TrueCar shows consumers what others paid for the car they want, so they can recognise a fair price. High Impact, Low Impact, Unexpected and Expected. 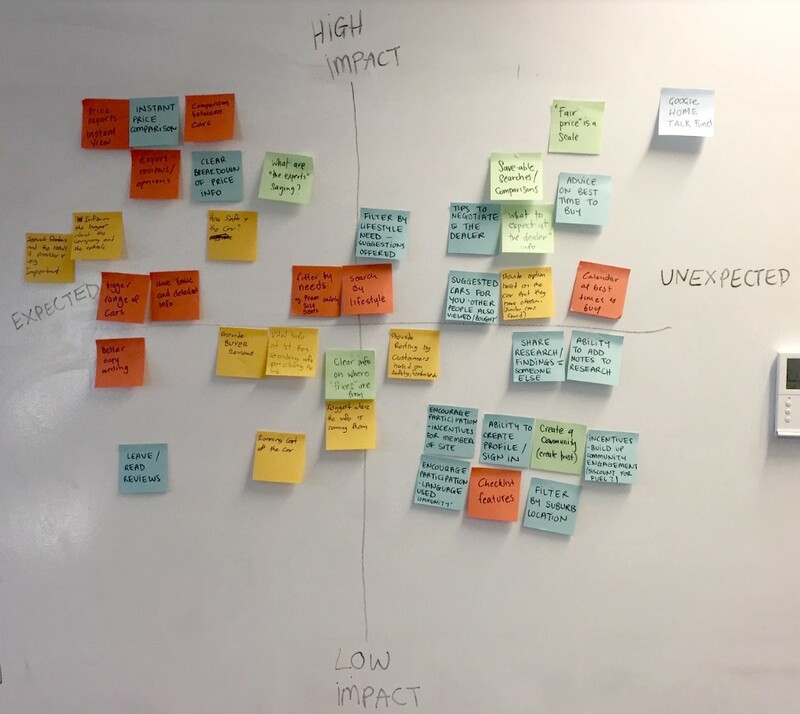 Each quadrant gave us a good indication of what features we needed to prioritise immediately and which features we would leave out and perhaps revisit at a later date. 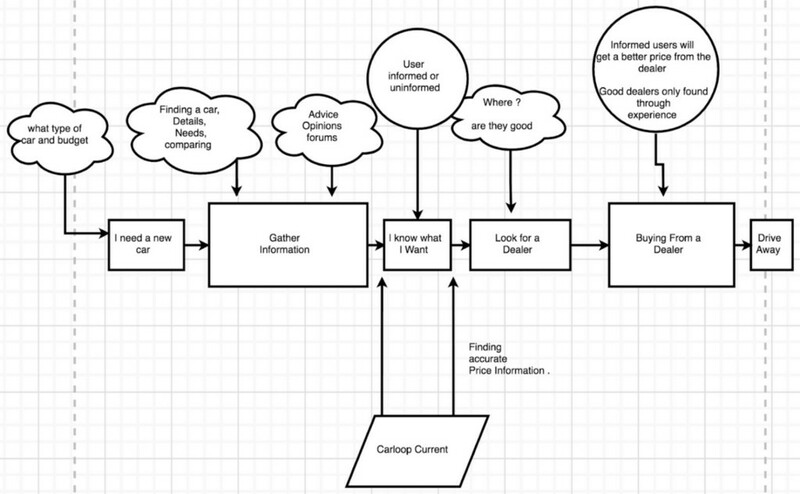 From our research we had discovered what factors were most important to our users when searching for a new car. We decided a card sort would be the most effective way for us to evaluate these and determine where and how they would be implemented into the site. Our team discussing a card sorting exercise. 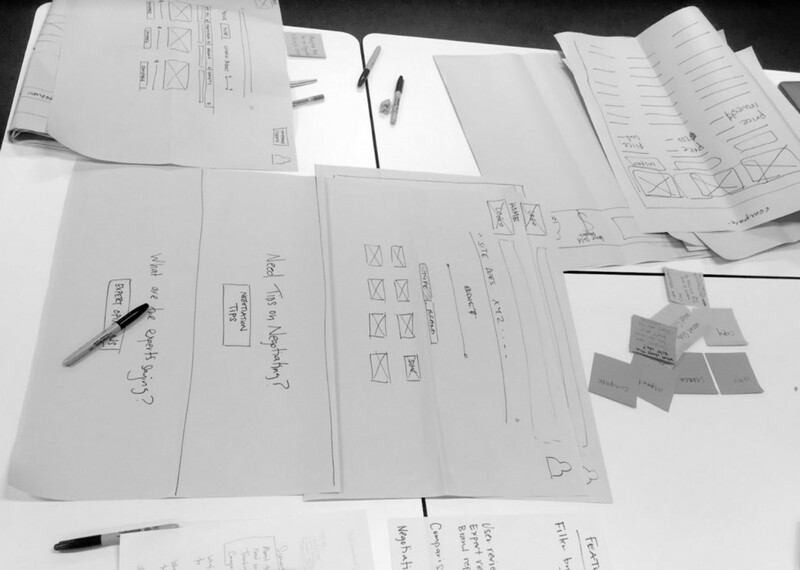 Rapid sketching exercises enabled us to generate a large volume of concepts which we would then critique as a group and vote on various features based on the results from our feature prioritisation. Through testing of the paper prototypes with multiple users we discovered emerging pain points early that required re-evaluation. 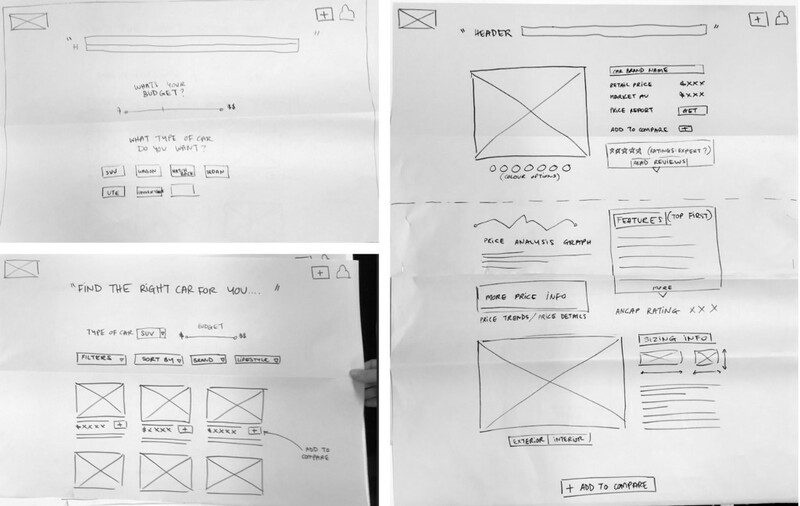 We iterated on these and continued testing with paper prototypes. 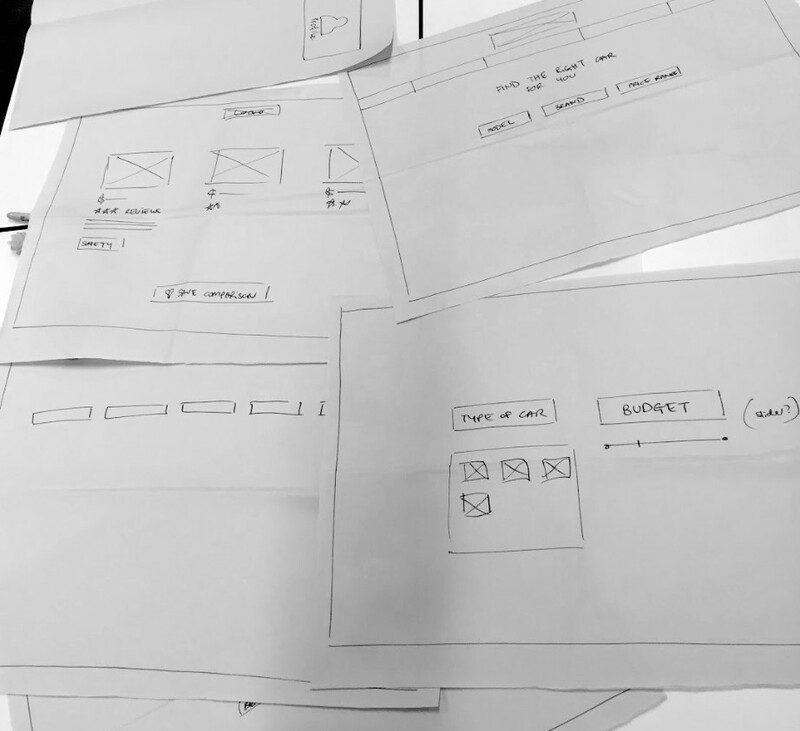 This process was repeated a number of times to ensure any issues that arose were addressed and iterated on the paper prototype before we began building the digital prototype. First round of usability testing with the paper prototype. An example of one of the paper prototypes used in testing. It wasn’t clear that Carloop is a research tool, users presumed they would be able to purchase a car and were disappointed when they were unable to do so. – We changed the copy at the home screen and introduced a 3 step system (Explore, Compare, Prepare) that made it clear from the start what users can expect from the Carloop website. The initial placement of the search bar with the copy ‘Already know what you want?’ confused users early in the flow. – We tried changing it’s placement in the flow and the copy however this still created confusion. We removed it entirely but found users wanted the option to be able to search. A search bar was added to the global header of the digital prototype and this tested well. Users felt restricted when asked to select the brand of car in the early stages of their research. – Initially brand was one of the first search options we asked the user to input. 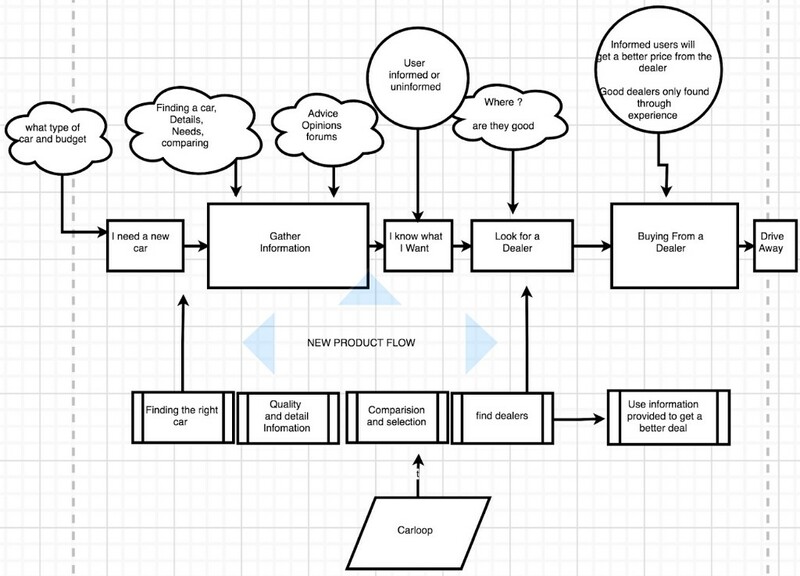 We removed it and instead added it as an optional filter selection later in the flow. ‘Lifestyle’ as an option to filter by was found to be confusing. – By asking users to input the type of car they wanted we were already asking them to search based on their lifestyle so we removed lifestyle as a filter option. For future development of the site we recommended to the client to incorporate a rating system that would offer the user with ratings and reviews of car dealerships. We identified this as a powerful contribution to the service in providing the user with quality information. 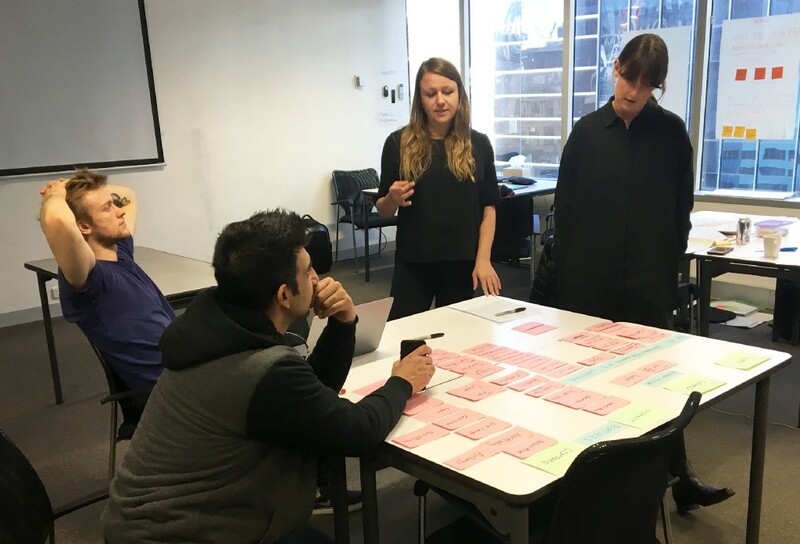 Communication: at the beginning of each day we prioritised a 15 minute daily scrum to discuss where we each were at, any concerns we had and what we intended to proceed with for the day. We maintained these daily and it was extremely valuable in establishing open communication within the team. Time Management: we used time boxing for almost all tasks throughout the project. This kept our team on track and enabled us to efficiently move forward at each stage of the project. 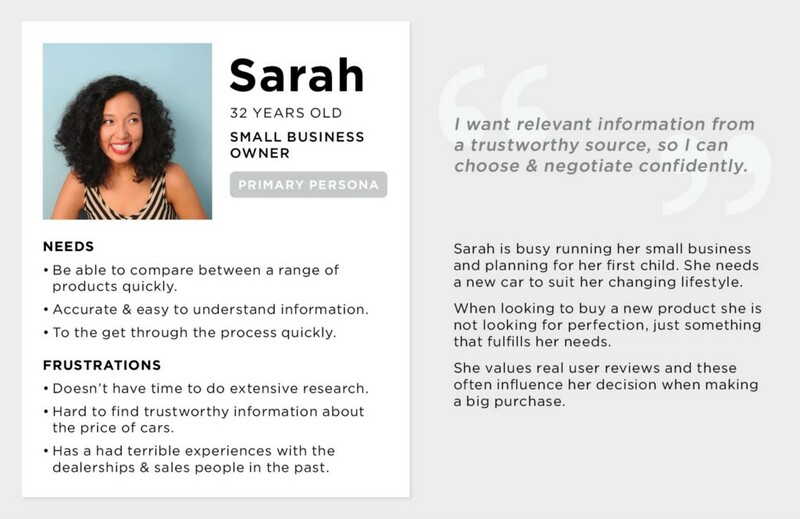 Personas are a useful tool for ideation and implementation: during the project if we ever found ourselves at a point of deliberation the personas we had created based from our research helped get us back on track by asking ‘Is this useful for Sarah or David?’ The answer could quickly steer us in the right direction. a multi-disciplined designer with a focus on UX and UI design, currently calling Melbourne, Australia home. With 8 years’ experience I have worked across a range of industries with each new brief challenging my creative approach and thinking in an exciting and unique way. Carloop website redesign: A UX Case Study was originally published in Prototypr on Medium, where people are continuing the conversation by highlighting and responding to this story.